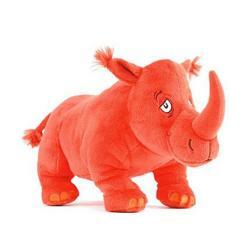 Rhinoceros Plush Toy From the story by Dr. Seuss! Your baby will like this plush toy! From the story by Dr. Seuss! Your baby will like this plush toy! This Kohl's Cares Dr. Seuss ABC "Rhinoceros" plush stuffed animal toy features a soft and cuddly texture! Rhinoceros is from the story by Dr. Seuss that features a variety of creatures each with a name that begins with a letter from the alphabet.